The first step, before we spray the color coats, is to again thoroughly clean the surface. Contaminants can hinder adhesion and create other problems later. Wax and grease remover will again be used, with plenty of clean rags, to clean the surface. If more than a few days have passed since final sanding, the surface should again be lightly sanded with a 360 or 400-grit wet sandpaper (or finer, for metallic paint) to “open up” the primer for maximum adhesion. Paint adheres best to a recently sanded surface. After the wet-sanding residue is carefully cleaned off, and all nooks and crannies are blown out with compressed air and thoroughly dried, the surface is wiped with a tack rag, a cheese cloth impregnated with a sticky wax-like substance. Lint or dust sticks to the tack rag and is removed from the primed surface as you wipe. Compressed air is used throughout the painting process — to apply paint as well as blow dust from the surface during cleaning. Clean air is critical. Worn or improperly maintained compressors and air systems are responsible for most paint failures. Compressors use oil for lubrication. Some oil passes into the air lines and eventually ends up in or on the painted surface. Paint and oil don’t mix. Pin holes, fish eyes, and a myriad of other adhesion problems can be caused by minute oil particles passing through the compressor to the air lines and into the sprayed paint. Moisture condenses in compressor tanks and air lines, so it must be drained regularly at the compressor drain valve and at a moisture trap in the air line system, either at or before the air regulator valve. These valves should be opened and drained regularly to remove as much oil and moisture as possible. A compressor of at least five hp is generally necessary to supply adequate air volume (measured in cubic feet per minute) for a spray gun. A smaller compressor may force you to stop periodically during painting to wait for it to build pressure. This can not only be irritating, but it also affects the quality of the job. A relatively new paint spraying system is called HVLP (High Volume, Low Pressure). Here, the spray gun operates on a somewhat different principle than the traditional syphon spray gun. Paint is applied in higher volume at low pressure (under 10 psi, as opposed to 45-70 psi for syphon equipment). Manufacturers recommend a minimum compressor of five hp. Virtually all HVLP guns today require 10-11 cfm at 80-100 psi going into the gun to have 8-10 psi at the air cap, where the paint is atomized. Paint transfer efficiency is greatly increased with HVLP gear; up to 80 percent of the paint ends up on the car, compared to 40 percent from a high-pressure syphon gun. This reduces pollution and paint costs. One trade-off is price; HVLP paint guns are considerably more expensive to buy, hardly worthwhile for one-time use. I’ve used an HVLP gun with great success to apply primer surfacer. Although many painters achieve success with HVLP in applying color coats and spot spraying, I prefer the old-style gun for spraying color. This is a matter of personal preference and experience. The latest HVLP guns are somewhat slower but work much better than early examples. Some local pollution-control laws require that HVLP units be used for the entire painting process. There are many standard paint guns to choose from, made by Binks, Sharpe, Matson, DeVilbiss, Sata, and Optima. They are suction, gravity flow, or pressure-pot oriented. Standard guns are much less expensive than HVLP equipment and are readily available used. For the price of a rebuild kit and a little time, they can spray like new. The higher the air pressure at the air cap of the spray gun, the flatter (more evenly) the paint will lay on the panel. However, more paint is atomized and will just blow away and miss the car. Practice and experience will help you to find an adequate compromise. When working with any paint or primer, always wear protective breathing masks with filters (charcoal) that remove chemical fumes as well as solid and dust overspray. With respect to respirator use and spraying isocyanide-cured urethanes, the use of filters with charcoal as the filtering agent is considered inadequate by OSHA since there are no indicators to advise when the filter is full of the contaminant. Since isocyanide is a cyanide, the paint industry has found it prudent to go much further with protection from emitted vapors. Full body suits, booties, rubber gloves, and air masks with a constant supply of fresh air from the compressor are essential. Don’t paint isocyanide products with anything but full protection. Isocyanide attacks the body’s involuntary systems, chiefly the central nervous system. Entry is not just through the respiratory system but also through the tear ducts of the eyes and any exposed skin. Initial out-gassing or drying of urethanes is equally hazardous. Failure to use respiratory protection is akin to driving without brakes. The first step in the actual painting (after priming) is to apply a coat of sealer, which provides a uniform background for the succeeding color coats. It also seals and minimizes penetration of paint solvents into the undercoating and promotes adhesion between paint and primer. Choose a light or dark sealer, depending on your paint color. Select a sealer recommended by the manufacturer to match the type of paint you are using. Many paint types are suitable for automotive refinishing. Today’s most common are acrylic enamel, urethane, and (decreasingly) acrylic lacquer. To make the paint thin enough to pass through the spray gun and be properly atomized by the compressed air, a reducer or thinner must be added. Acrylic enamel paints, especially urethanes, require addition of a catalyst, which chemically hardens the paint in much the same way that adding catalyst to fiberglass resin causes the resin to harden. Acrylic lacquer needs only a thinner to reduce its viscosity before being sprayed and requires only air drying. Paint type is a matter of personal choice. Lacquer generally requires more time to apply — 8 to 24 coats — but is more forgiving in terms of application skill. It is also somewhat easier to repair runs and sags as well as spot-repair of later damage. Catalyzed acrylic enamel and urethanes are extremely durable — more so than acrylic lacquer. Their fumes are highly toxic, so respirators and other safety gear must be worn when working with these products. Lacquer or acrylic enamel without the catalyst can be shot at home with modest protection. Automotive lacquers may be on their way to being eliminated in some areas by the EPA. For show quality paint work, I prefer acrylic lacquer. A typical lacquer job requires 12 to 24 coats. Drying time between coats is minimal, usually only a few minutes for the solvents to “flash off” (evaporate). Six to eight coats are applied, then the paint is allowed to dry overnight. Within the next few days, depending upon the weather, the surface is water sanded with 500-grit wet sandpaper to remove surface unevenness (orange peel) and dust particles. After being thoroughly cleaned of the wet-sanding residue, the dried surface is wiped with the tack rag, and another six coats are applied, each succeeding coat being reduced slightly more. Initial coats should be thinned 1-1/2 part thinner to 1 part paint. The last two coats are at a consistency of 3 parts thinner to 1 part color. For the last several coats, I use a slower-drying thinner to increase the flowing out characteristics and gloss of the lacquer. Acrylic enamels and urethanes are applied similarly to lacquer. Fewer coats are needed, though, because more paint is applied with each coat with heavier viscosity (usually 1/2 to 1 part thinner to 1 part paint). For metallic colors, application of a clear coat over the color is essential to protect it. With acrylic enamel and urethane, generally three coats color and three coats of clear are appropriate; with lacquer, usually six to eight coats of color, followed by six to eight coats of clear. Painting requires a thorough reading and full understanding of the paint manufacturer’s directions. If mixed exactly according to directions, an acceptable finish can be expected once you understand the spray gun to be used. For best results, a properly filtered and ventilated professional paint booth is a must. You may be able to rent one by the hour in some cities. Dispose of excess paint, thinner, and clean-up materials properly. Environmental concerns mean that fewer and fewer amateurs paint cars. A spray gun, clean and in good condition, properly atomizes and applies the paint in a minimum of time. Spray guns generally have two adjustments. The spreader valve, usually near the head of the gun, regulates air flow that controls the spray pattern, from round to oblong. Turning down the air spreader valve reduces air to the two horns in the spray gun head and produces a round pattern. Opening the valve flattens the pattern, producing a more oval shape. Not only can the shape of the pattern be varied, but also its size. The spreader adjustment is the key to economical painting. Never use a pattern wider than the surface being painted. Guns can be adjusted to round or oval patterns. Top-heavy pattern caused by partly clogged horn holes, obstruction on top of fluid tip, dirt on air cap seat or fluid tip seat. Heavy right side pattern caused by partly clogged right side horn holes, dirt on right side of fluid tip, or clogged air cap right jet. Heavy left side pattern caused by partly clogged left side horn holes, dirt on left side of fluid tip, or clogged twin cap left jet. Split pattern due to improperly balanced air and paint; reduce width using spreader adjustment valve or increase fluid pressure. The fluid adjustment controls the amount of paint flowing from the gun. Spot jobs, for instance, require low paint flow; overall panel painting requires maximum flow. Depending upon the type of paint and its viscosity, air pressure is adjusted to atomize the material. An air regulator, at the gun or at the air filter/transformer, controls the atomizing air pressure. Correct pressure, a matter of experience, is arrived at by spraying a series of test patterns. Pressure at the syphon-type gun is normally 40-60 psi. Too low a pressure results in an under-atomized, or orange peel, surface. Too high a pressure wastes paint, leaves a rough, dry finish, and may also create orange peel. It is important to spray at the correct distance from the panel. Enamels and urethanes are usually shot from 8-10 inches away, about a normal hand span. Lacquers are sprayed from 6-8 inches away. Get too close, and the paint will go on too heavily and run. Too far away, and the paint can be dry and sandy. Hold the gun at the correct distance throughout each stroke. It should also be perpendicular to the surface. If the gun is angled, more paint is applied at one end of the spray pattern, less at the other. Work for a wet coat. Use slow, steady strokes. Never fan the gun from side to side; keep your hand and the gun square to the surface. To ensure proper coverage, overlap each stroke by 50 percent, i.e., aim the center of each stroke at the edge of the previous one. To get even distribution and film thickness, always hold the gun perpendicular to the surface of the panel, as in the left diagram. The right diagram is incorrect. Pull the trigger at the beginning of each stroke at the edge of the panel you’re painting. 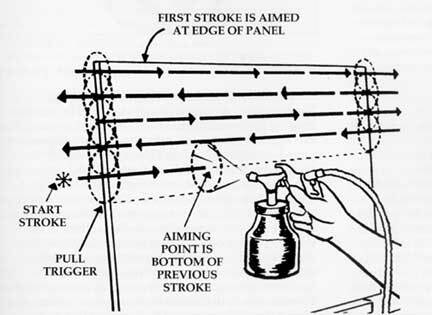 Continue the stroke to the other edge of the panel, and release the trigger there. Your stroke should be smooth and easy, slow enough for sufficient material to be applied yet fast enough so that not too much goes on, which causes sags. To minimize the amount of dry spray falling onto freshly painted parts—especially hoods, trunks, and roofs—work away from the previously sprayed panel. When spraying an entire car, plan your sequence of spraying to minimize overspray on drying adjacent panels. For example, start at the back of the right front fender, work your way around the hood to the left front fender then to the left door. Shoot the left side of the top, then the trunk, the right side of the top, the right rear fender, and finally the right door. Painters have different methods, but the aim is to minimize overspray on drying panels. Spraying into semi-dry areas will cause heavy orange peel or rough, sandy texture. The ideal temperature for spraying is about 70°F. Special thinners and reducers can speed up or retard drying time; use slower thinners in hotter temperatures, faster thinners in colder temperatures. Humidity is also a factor, especially with lacquer. High humidity (moisture) in the air supply can be trapped in rapidly drying paint, causing a “blushing” surface that appears chalky or dull. Spray in the lowest possible humidity. Judging how much paint is being applied is a matter of experience. The object is to apply enough paint with each succeeding pass of the gun so that it flows out smoothly without running or sagging. Ideally, you apply just the right amount so that the paint flows out to form a surface as smooth as glass. If you pass this point, the paint begins to run. Paint problems such as runs, sags, and dirt particles can be remedied after the paint dries. Depending on the type of paint and temperature, this can take several hours or several days. A rubber sanding block with 500 or 600-grit wet-or-dry sandpaper is used to gradually wear down the high areas of the run or sag. (One trick is to mark the paint next to run with a broad felt-tip marker, then sand only until you see the mark begin to disappear). With non-metallic paint, you can either finish polishing or apply more coats, depending upon when in the spraying process the run occurred. With metallic paint, the area of the run must be blended, with more paint applied to even out the metallic at the problem area. Clear coats can then go on, followed by final finishing. Dry, sandy-appearing paint is at the other end of the spraying spectrum. In this case, the paint will have a dry, rough, or dusty surface appearance. This problem can be caused in various ways. First, excessive air pressure relative to the paint flow may cause the paint to break up into small, dry particles. Second, paint that is too thick to pass smoothly through the gun onto the surface can cause a rough, dry appearance; add more reducer. (This can also be caused by using a reducer or thinner that dries too fast, not allowing the paint to flow out.) Finally, holding the spray gun too far from the surface causes paint to “dry out” en route, yielding a dry, uneven surface. Thanks to Bill Edwards at Restoration Services for his assistance with this article.